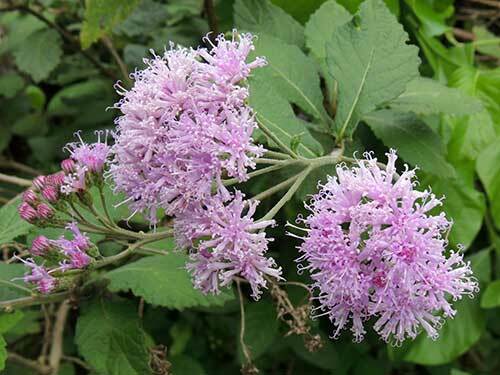 Kenya Natural History Guide >>> Plants >>> Composites/Asteraceae >>> Vernonia sp. Observed not far from a tended garden at Iten, Kenya. January 2012. 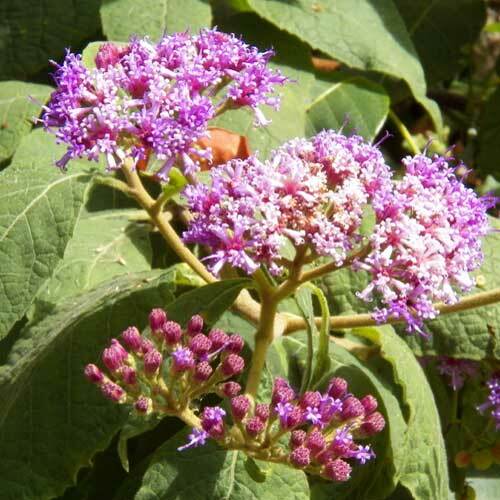 Disc Flowers: The disc flowers are a shade of lavender-purple. The numerous heads are arrayed in flat-topped groups. The disc flowers have long tubes and five lobes. Ray Flowers: No ray flowers. Phyllaries: The severl dozen florets are subtended by two rows of bracts. 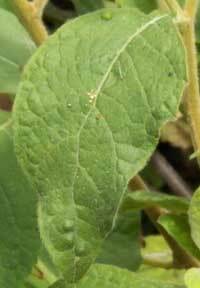 Leaves: The alternate leaves are broadly elyptic with wavy margins and the leaf underside is whitish. Some shallow serrations also. This example was found along a sunny path in the Taita Hills, Kenya. 29 May 2017.